Why so serious? Heath Ledger's greatest role is brought to three-dimensional life in this statue in the DC Gallery line. 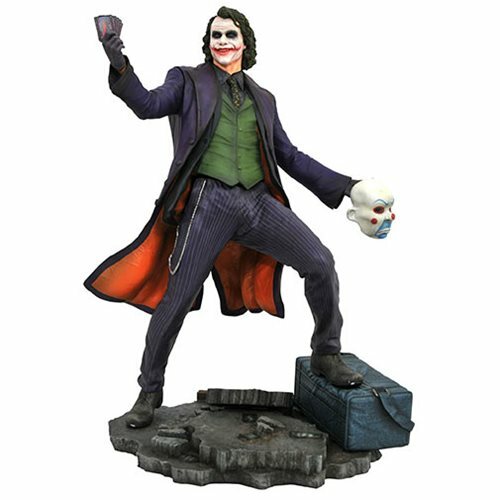 Joining Batman and Bane (sold separately), this 9-inch tall sculpture of the Joker as he appears in The Dark Knight depicts him holding a hand of playing cards with his clown mask and a bag of money at his feet. Made of high-quality vinyl with exacting paint details, it comes packaged in a full-color window box. Designed by Shawn Knapp and sculpted by Rocco Tartamella!